Inside: 3 strategies for how to succeed at a no-spend month. Learn what worked and didn’t work for my no-spend month so you can save money, too! Complete with a worksheet to help you plan for your no-spend month! For months (and months and months), to make ends meet, I have been withdrawing the very same $100 I put in savings each paycheck. Retirement looms. So does Christmas. And my budget? Yeah, it is not working! Yes, I have a budget–it’s even supposed to be a zero balance budget, which is a budget in which you plot out every expenditure so that your income and expenses equalize, resulting in a zero balance. Problem is, I cheat. I know that extra, unexpected expenditures will come up, so I leave a little fudge in my budget, meaning it is not really a zero balance budget! Although my intent with that fudge has been to spend it on the unexpected medical copay or a school supply I would learn of too late (“My teacher said I need it by tomorrow,” says the kiddo at 9:37 p.m. the night before), the reality is that I see the cute shirt on sale that’s exactly the color and style I was looking for (so I tell the good angel on my shoulder), and I purchase it. Pretty soon, the fudge is gone, and to cover the copay or just-learned-about-the-night-before school supply, out comes the $100 I had put in savings. 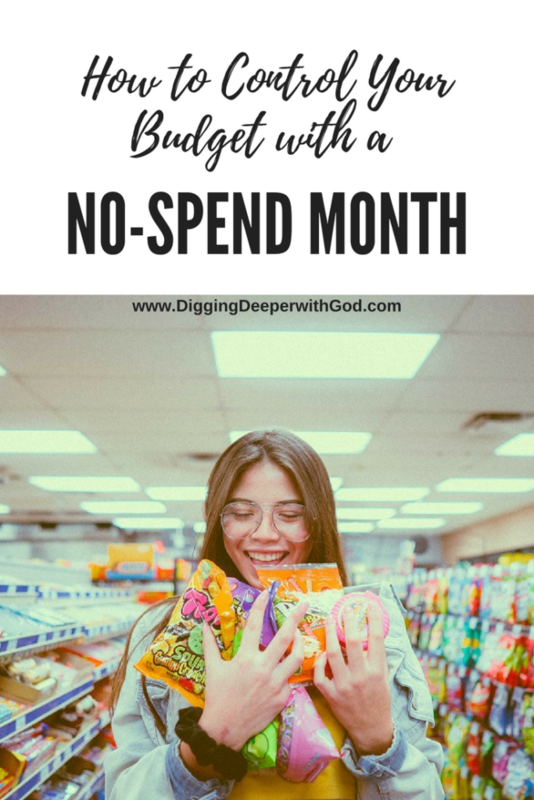 So when I read Jessi Fearon’s encouragement to try a no-spend month, I immediately got excited about this strategy to help me curb my extra spending! I dove in pretty fast, setting a start date and deciding what a no-spend month would look like for me. The general idea is that for one whole month, you spend money only on necessities: groceries, gas, utilities, and rent or mortgage. You don’t go out to eat, go to a movie, or spend money on anything extra. Did I just lose you? Read on, because you can make this work for you! Below are three tips to help you succeed at your own no-spend month. The thing is, you can make this your own. You want to set guidelines that will work for you! You might even start with a no-spend day or a no-spend week and work up to a no-spend month. Use this worksheet to plan for your own no-spend month! Learn from my successes and failures! You need to decide when you will start and end your no-spend month (or day or week). This might seem pretty obvious, but think it through. You might not want to do a no-spend month when you’ll be going on vacation, have a lot of family celebrations, or will be tempted to spend extra money. For example, if you do a lot of shopping on Black Friday, you probably shouldn’t choose November for your no-spend month! Guess what I did? In my efforts to avoid doing my no-spend month when I would be traveling to a family reunion, I scheduled it to run from July 15 to August 15. Do you know what started July 16? Amazon’s Prime Day. Seriously. It was awful. There I sat, watching deal after deal pass before my eyes, and I couldn’t buy a thing. This was probably very good–I saved tons of money because of the commitment I had made to not spend money on extras–but it was also quite a battle of the wills! Furthermore, I thought July 15 was on a Monday, and when I went to make some planned, extra purchases on Sunday, I faced a moral conundrum. Should I make those purchases or not? The true no-spend month is pretty intense! The principle is to not buy a-n-y-thing extra. This is where you have to establish boundaries ahead of time! I didn’t go hard-core my first time out with this. I decided I would spring for one meal out a week. By meal out, I don’t mean eating at a sit-down restaurant, tip and all. I mean we will go to a drive-through and try to feed three people for under $15 or four people for $20. Before starting the no-spend month, I had also decided we would keep our tradition of stopping at QuikTrip on our way to church. QT is a full-service gas station and convenience store. Don’t judge me! Or if you do, just don’t tell me! This has been a nice way to calm an otherwise hectic morning. We build in the time to stop, and I will buy each person one breakfast item. On the way there, I get the kiddos to decide what they will get so that we can walk in and walk out in six minutes, tops. Typically, I can pay for three of us for under $7. Tummies are filled, I don’t have to clean up spilled milk or dishes (or nag others to do so), and going to church doesn’t seem so bad after all for the preteens. One of them told me the other day that she is going to keep that tradition with her children! (I hadn’t thought of it as a tradition until she said that.) It’s a clear win in my book! I decided I would not buy any clothing items this month. I would buy all of our regular groceries–I wouldn’t put undue restrictions on them. We would not make random midweek runs to QT, Sonic, or any other store. I would pay all my normal bills, but I wouldn’t make big efforts to pay extra on any bills. My main goal was to prevent having to withdraw that biweekly $100 that I was supposed to be saving. If you are going to do a no-spend month, you’ll need key people in your life to know about it and be on board with it. I floated the idea a few weeks before my July 15 start date. This gave us all time to talk through different situations that could come up. Be prepared to be challenged, and be prepared to listen to good ideas. It was during these discussions that I landed on one meal out a week and continuing to stop at QT on Sundays. How Has My No-Spend Month Actually Played Out? Failure is such a loaded word! Instead, let’s just say I didn’t stick with the plan in its entirety. Primarily, I didn’t stick to one meal out a week. In Week 1, I managed to stick with one meal out until one girl had a friend stay overnight, and I was tired from the long day. We decided to order a pizza, but this became two pizzas, because one wasn’t going to be enough. So that bill came to $18 plus change, which is not bad for two pizzas, but it is still more than what burgers on the grill would have cost! During Week 2, I also ate out twice, but with an added purchase: We have been navigating a personal crisis with a family member, and today I bought donuts all around for the kiddos. I don’t normally eat donuts, but I bought two for myself! They were yummy, and I honestly feel no guilt. I’m going to call them groceries! In addition, remember how I said I thought my start date fell on a Monday? I had planned to make two purchases for my garden on the Sunday that was my actual start date: neem oil to rid my apple tree of Japanese beetles and apple maggot traps to prevent apple maggots. Gross, I know, but it is reality. I decided to still make those purchases. The neem oil ($46) felt like a necessity, to prevent the problem from being even worse next year. I killed hundreds of Japanese beetles, so I feel justified in that purchase. However, in hindsight, I could have waited until next spring to purchase the apple maggot traps ($18), because it is too late to use them this year. I said no to going to a play that would have cost $35. I declined an offer for a night out at Top Golf–this would have been dinner and entertainment and loads of fun! But it would have easily cost $25. Because I had said no to those high-dollar entertainment activities, I said yes to a $5 movie one night. That seemed reasonable to me. I did not purchase anything on Prime Day. I dunno–that sort of felt like a loss! Even with my extra meals out, I still ended up paying less for meals out than I normally do. One of the preteens and I walked past a very cute pair of shorts for $5.88 one night. She started to ask me if I would buy them for her, and she retracted her request as soon as it was partway out of her mouth. 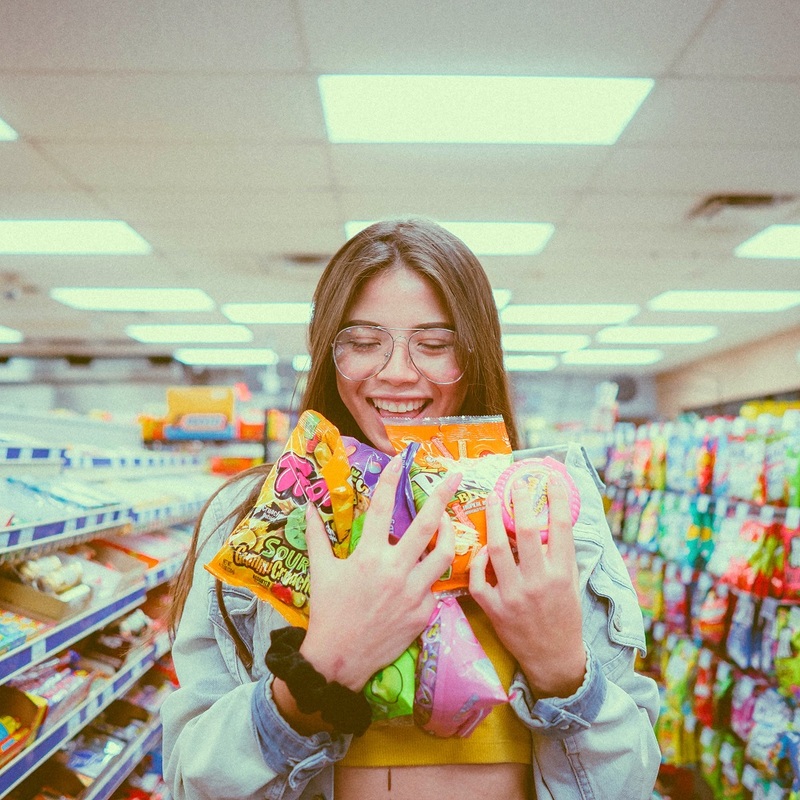 The other preteen–the one who lets money sift through her fingers (earn it, spend it, earn it, spend it)–thought about making a purchase at a store, put it back on the shelf, thought about it again, put it back on the shelf again . . . and walked away. WIN! Offer after offer arrived by email and snail mail (BOGO offers, 20% offers, buy now pay later offers). I refused them all, deleting the email or recycling the postcard. You can, too! It is very empowering to decline such offers! 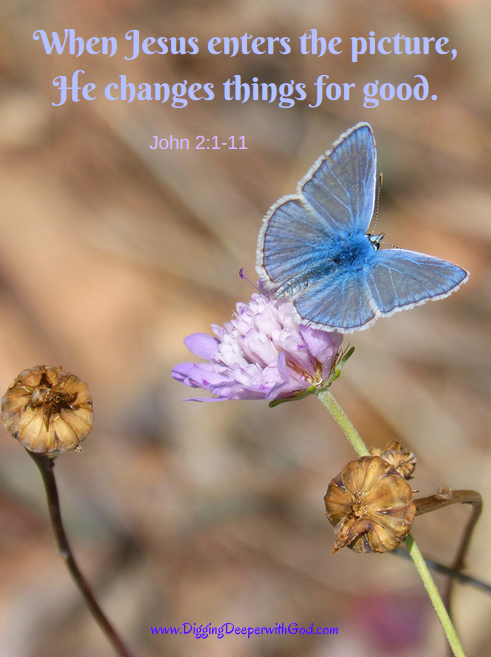 The biggest win is that the no-spend month shifted my perspective. I didn’t wince at not buying that cute pair of shorts. One night, I could have taken the girls bowling or mini golfing. Instead, we played tennis, which was free. You can experience this victory, too! Download the worksheet Planning for Your No-Spend Month and start planning your own no-spend month! Get your own Real Life on a Budget Planner to help you master your money! See the details below! What do you think about the idea of doing a no-spend month? Real Life on a Budget! I first heard of the no-spend month from Jessi Fearon. Her site is packed with budget tools and tips, and you can purchase her planner to help you master your money! 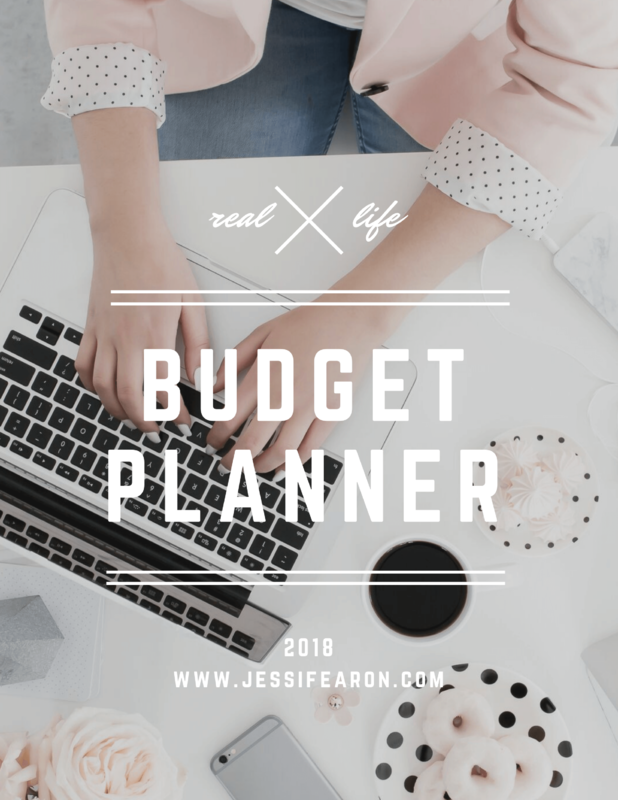 The “Real Life on a Budget Planner” contains calendar pages for 2018, monthly budget pages, monthly expense tracking pages, goal tracking, monthly check-ins, debt repayment tracking, savings tracking, bill pay tracking, holiday budget planning and more! You can insert calendar pages for each new year.